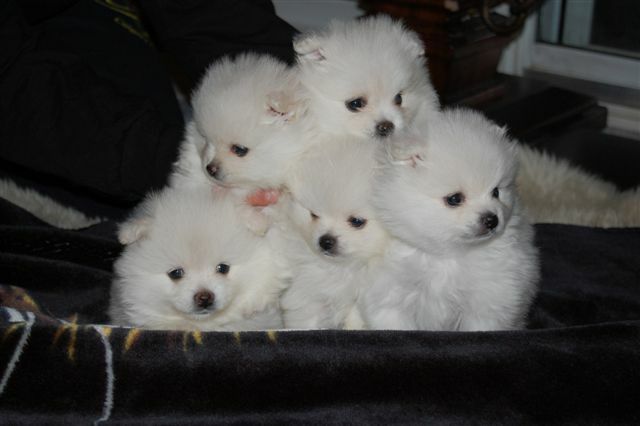 Welcome to the site of Wigglypaws white and cream Pomeranians. Photos of my beautiful Pomeranians. My name is Betty Spitzer and I am a small breeder focusing on breeding quality creams and whites. I live on five acres in beautiful Fernie, British Columbia, Canada. I raise all my pups in the house with me. I have 4 breeding females and 2 breeding males. My Poms have come from www.adoringpoms.com, www.royalteepoms.com and CJ poms in Kansas. They have top pedigrees with championship bloodlines. All are CKC and AKC registered. I do have puppies occassionally and all pups come with CKC papers, vet checked, first shots, dewormed, microchip and a health guarantee. I try to breed for show and pet quality staying with the standards of the CKC.